At PAX Aus 2017, the WellPlayed team went hands-on with a number of promising and exciting looking titles. One of the games that stood out amongst all the noise was Hyper Jam, a four-player 80s-inspired party brawler from Melbourne-based studio Bit Dragon. Back then the game was still deep in development, now it’s on the precipice of releasing with the game’s February 12 release right around the corner. 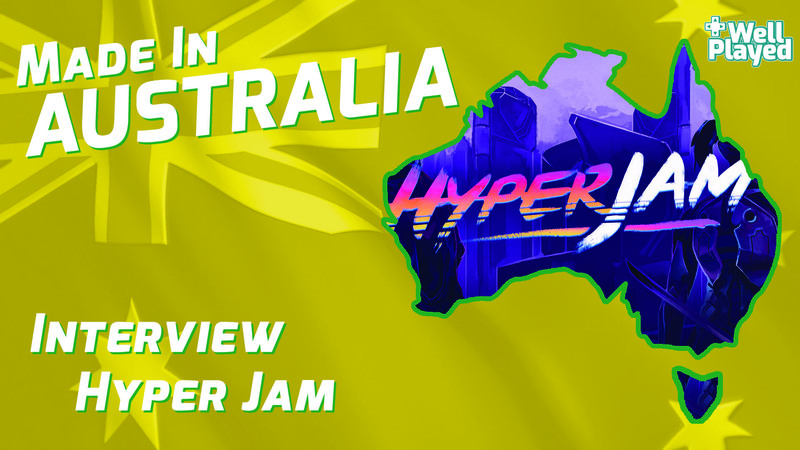 As part of our Made In Australia segment for February we’ll be covering Bit Dragon and Hyper Jam. I spoke to Bit Dragon director and Hyper Jam programmer and producer Roman Maksymyschyn about the upcoming PS4, Xbox One and PC party brawler. WellPlayed: In your own words, tell us what Hyper Jam is all about. Roman Maksymyschyn: Hyper Jam is a fast-paced arena brawler featuring a killer synthwave soundtrack and a dynamic perk drafting system that makes each match different from the last. WP: Where did the idea for the game come from? RM: Hyper Jam draws inspiration from many places, for example the perk drafting mechanics were inspired by games such as Risk of Rain and Binding of Isaac where you never know how your character will end up at the end of each game. RM: We have been working on Hyper Jam full time for almost 2 years now, and had been working on it in our spare time for a year or so before that. WP: The game has come a long way since it was first revealed in 2015. How much has the game changed since then? RM: While the game has come a really long way since our initial prototype, many of the core mechanics and principles we built the game on are still present. WP: Were you always planning to release Hyper Jam on PS4, Xbox One and PC simultaneously? RM: Getting Hyper Jam onto consoles has always been a dream of ours, but always thought it was going to be a stretch goal, not a sim-ship launch! WP: What inspired the heavy 80s-themed aesthetic? RM: We would listen to a lot of synthwave music while developing the first prototype of the game, and we felt it fit the gameplay so well that this eventually became the primary theme of the game! It’s amazing to be able to feature many of the artists we listened to while working on the game as part of the official Hyper Jam soundtrack. WP: Who’s the mastermind behind the soundtrack? RM: The soundtrack features a variety of our favourite Synthwave artists, and includes tracks by Carpenter Brut, Dance with the Dead, Meteor, Electric Dragon, Vulta and Cloud Battalion. WP: Can we purchase the soundtrack anywhere? RM: We intend to release the soundtrack on Steam, and will be available via most major audio streaming/distribution platforms as well. WP: Party brawlers seem to be making a comeback, especially in the indie scene. What do you think is the main reason behind this renaissance? RM: All of us in the dev team grew up playing couch co-op games with/against our friends, however many modern games have scrapped this in favour of online multiplayer, which I think some people miss. Thankfully in Hyper Jam we support both local and online multiplayer with 2-4 players, so have the best of both worlds! WP: What’s your favourite perk in the game? RM: My personal favourite has got to be Cryogenesis, since the effect looks really cool and it creates a window to punish the opponent quite hard, especially if they are spamming parry while frozen. WP: How many game modes will be in the game? RM: At the moment we are focusing on our core free for all mode, however we have several modes in the works internally that we hope to release at a later date. WP: Do you have any post-launch content plans, such as additional characters or modes? RM: There are lots of things we’d love to add to the game post-launch, however at this stage we are still playing it by ear and seeing what the community wants from the game before investing too heavily in any particular area. WP: Developing a game for three different platforms at the same time can be a daunting task, especially for studios with only three members. Were there any challenges you had to overcome relating to multiplatform development? RM: It took us a lot of work to port the game to multiple platforms with such a small team, since there are many platform specific requirements that you have to meet before you can release your game. It was even more challenging for us since we wanted to allow cross-platform online multiplayer, which required us to set up an entire backend to support (we made it in the end though!). Even though it was very difficult, we are much better game developers as a result of the lessons learned along the way, and have features that are usually reserved for AAA titles as a result of pushing ourselves the extra mile. WP: We’ve played the game a couple times at PAX Aus and it was an incredibly fun jaunt. How has the public’s reception been at conventions such as PAX? RM: Hyper Jam is a game that gets people excited regardless of whether they are playing or watching, and as of such I’m happy to say that it is always received extremely well at conventions such as PAX where there are groups of friends competing for the crown with an audience to cheer them on. WP: Did you ever consider going down the free-to-play route? RM: It has been brought up in the office, but at this stage we feel that Hyper Jam makes the most sense as a premium product. WP: Is there any chance the game could find its way to the Nintendo Switch? RM: We’d love to see Hyper Jam on Switch one day, but no concrete plans to port it yet. WP: Thank you for your time. RM: You’re welcome, thanks for the interest in our game!